The best part of being a student in London is that you get to visit the world’s best trade shows and fashion events while you are here. 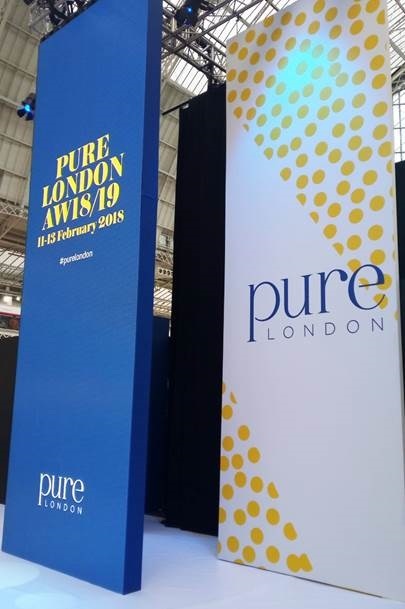 Among many others that I have recently visited, Pure London was one of the UK’s largest trade show and one of my favorite as well. I will be telling you later in the blog the reasons why I say that and what inspired me the most throughout the three day event that was organized at Olympia London, Kensington from 11-13th February 2018. As soon as I entered the event, I could sense the vibrant and electric atmosphere around me. There were around 800 labels exhibiting, seminars arranged by the industry experts, catwalks showcasing emerging designers and thousands of visitors immersing themselves in the fashion hub that was created for them. It didn’t take me long to pick the seminars and catwalks that I wanted to attend for the rest of the day! This seminar was hosted by Paul Mcgregor (Founder and Editor – Mens Fashion Magazine), with speakers Carl Thompson (Founder – Hawkins and Shepherd), Mitchell Webb (Founder and Writer – thefashionwebb.com) and Ed Lemont (Founder and Editior – The Discerning Man). The speakers discussed the use of social media for promotion and how to approach influencers for your business. Social media like YouTube, Instagram and blogging were considered as the main sources to engage with your audience, create brand portfolio and are also used behind the scenes for marketing purposes. In terms of getting to work with a brand, influencers should genuinely like the brand, get to know them personally and build a relationship instead of just running a post. On the other side, on being a brand, you should research in detail which influencers will match with your business aesthetics and would be great to collaborate with in the long term. This seminar was conducted by Karolina Barnes (Editor in Chief and Creative Director – Estila). She explained how a brand is created with a proper strategy and a mindset instead of just having products and a system lined up. To create a brand that will last in today’s fashion saturated market, you need to know six main points for your business which are: trigger, frustration, concept, purpose, mission and vision. Once you line up your strategy through these points, you will understand your end goal very well, know your target audience and how to approach them. Brand story is as important as other parts of the business, so make sure it’s original, authentic and has a connection with your audience. 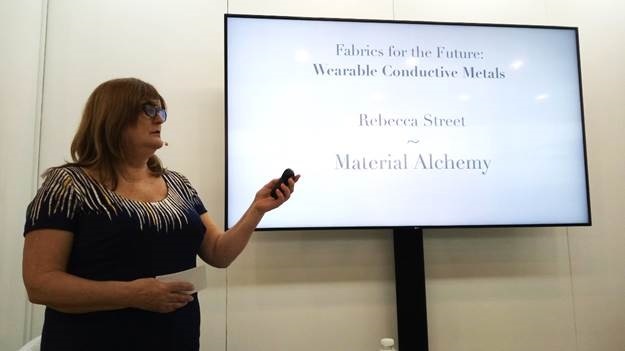 An interview was conducted by Linda Laderman (Co-founder of Textile Forum with Rebecca Street (CEO – Material Alchemy). This was quite interesting to get to know Rebecca’s personality as a Fashion Designer and Engineer. Her approach towards creating garments is quite unique and creative as there is always so much more to a garment than meets the eye. Her garments are engineered with elements in addition to textiles and fibers. Rebecca shared her experiences creating garments for well-known designers such as Alexander Mcqueen and her collaborations with brands like House of Fraser. One of her creative works creatively combined LED lights, gold and silver in her clothing items which was fascinating to look at and innovative at the same time. Overall, it was a really great experience in terms of learning and networking. 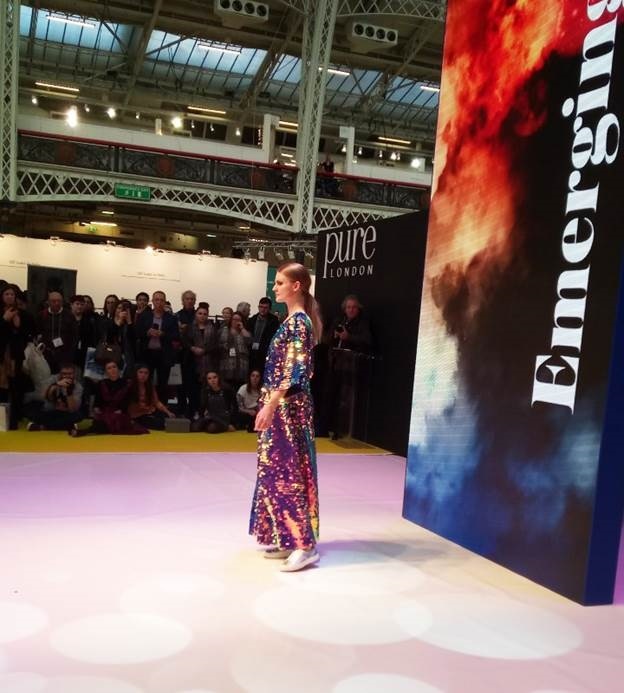 Being a British School of Fashion student especially, I would highly recommend others to take sometime out and visit trade shows in London, which will enhance your experience and allow you to get yourself acquainted with what’s going on in the Fashion industry.